The links below the product name can be used to jump directly to sections on the screen. Check this box if you want to override the regional setting for the Funding Curve Family that is used to calculate the Spread Lock on a fixed rate loan for the product type that you are setting up. The maximum duration allowed for rate locks for loans of this type. Check this box if you want users to be able to specify an Expected Life shorter than the Maturity of the loan being priced. The maturity that will be originally set when a new loan of this type is created. The Fixed Rate Spread Lock Funding Curve Family that will be used when a new loan of this type with the "Override Fixed Rate Spread Lock Funding Curve Family" option checked is created. The fixed rate lock that will be originally set when a new loan of this type is created. The expected life that will be originally set when a new loan of this type is created. This field will only show up if the "User can specify Expected Life" box is checked in the General section. The payment type that will be originally set when a new loan of this type is created. The amortization that will be originally set when a new loan of this type is created. If LOC is selected as an available payment type, then this option will appear. If enabled, lenders will be able to define the portion of the create scheduled commitment that is expected to be available to the borrower for LOC payment types. Checking this box will allow lenders to create an interest rate schedule for the rate type(s) that you select. The rate type that will be originally set when a new loan using this product is created. The floor that will be originally set when a new of this type is created and the rate type is adjustable or floating. Checked indices will be available for the lender. The index that will be originally set when a new loan of this type is created and the rate type is floating. The index that will be originally set when a new loan of this type is created and the rate type is adjustable. The adjustment frequency that will be originally set when a new loan of this type is created and the rate type is adjustable. This option is disabled by default. If enabled, lenders will be able to price an adjustable structure at an index plus a spread instead of an adjustable rate structure with a fixed period and initial rate. The fixed period that will be originally set when a new loan of this type is created and the rate type is adjustable. Checked swap indices will be available for the lender. The swap index that will be originally set when a new loan of this type is selected and the rate type is swap. The swap profit percentage that will be originally set when a new loan of this type is selected and the rate type is swap. The annual fee that will be originally set when a new loan using this product is created. Percentage of the loan amount or commitment that will be added to the fees when a new loan of this type is created. This is a one-time fee charged at origination. Dollar amount that will be added to the fees when a new loan of this type is created. Percentage of the unused amount of commitment that will be added to the fees when a new loan of this type is created and the payment type is LOC. Checking these boxes will allow that interest calculation to be available for this product. Checking any box here allows that tax exemption type to be available for this product. The interest calculation that will be originally set when a new loan of this type is created. The tax exemption that will be originally set when a new loan of this type is created. The default index scaling factor that will be originally set when a new loan of this type is created and index scaling factor is enabled. Allows you to set the LGD Calculation Method used for this product. This option is enabled by default when creating new Commercial Loan products. Unspecified Risk Weight (100%)" is the default exposure type for products in PrecisionLender. If you have anything other than 'Unspecified Risk Weight (100%)' selected on a product, users will begin seeing a new section within the Opportunity called "Exposure". Here the user will be able to select the exposure type per loan. If the exposure type is a Foreign type, the user will be allowed to select a country type. The risk weight that is returned per country is based on Basel standards. Note: If a product already has a Minimum Capital Allocation, the minimum would be multiplied by the risk weighting. Minimum Capital Allocation is set in Risk Ratings. The exposure type that will be originally set when a new loan of this type is created. This is used to set different origination fee defaults for loans coming through Relationship Awareness than the defaults for loans being priced. 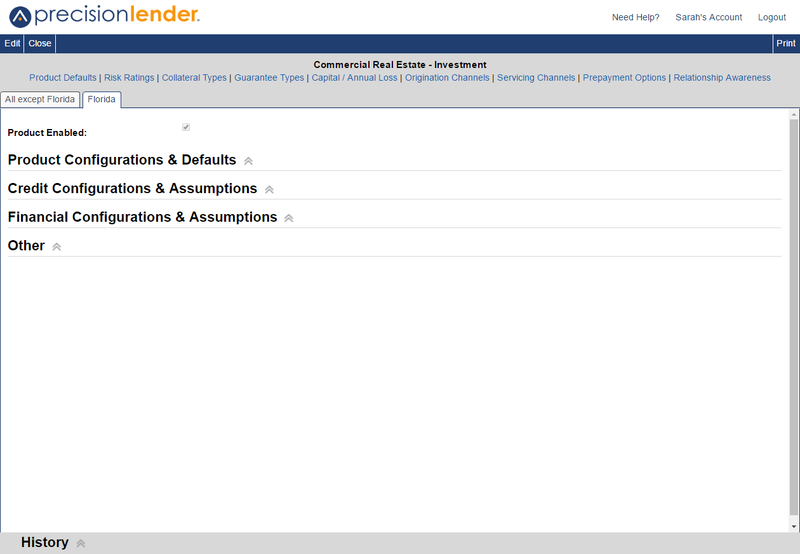 If this box is unchecked, RA will use the defaults for loans being priced, configured in the Origination section above.